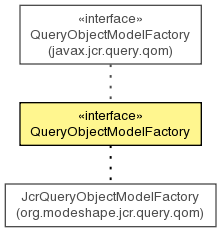 An extension to the standard JCR QueryObjectModelFactory interface, with methods to create additional components for more powerful queries. InvalidQueryException - if a particular validity test is possible on this method, the implemention chooses to perform that test and the parameters given fail that test. See the individual QOM factory methods for the validity criteria of each query element.